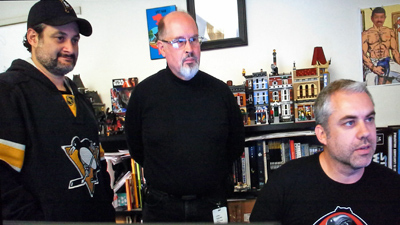 The crew of The Ghost help to develop the burgeoning Rebel Alliance, while facing off against the suave and calculating menace of Grand Admiral Thrawn. 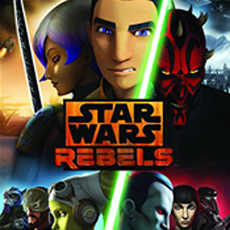 Star Wars – Rebels has continued to be a deserving hit for Disney XD, often drawing a million viewers per episode. (Well, that’s pretty good in today’s fractured TV viewing landscape.) After ramping up the action and intrigue in Season Two, there was no doubt that the intrepid crew of The Ghost has become a vital part of the Rebel movement. 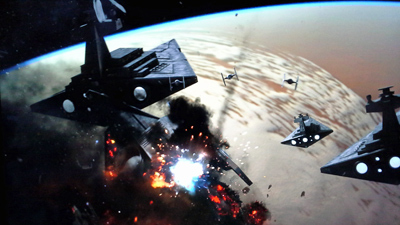 Unfortunately, the growing strength of the Rebels has garnered the notice of the Empire. No longer does the Empire view the rebels as pests; there is a growing awareness that they present at least a small threat, and need to be dealt with. 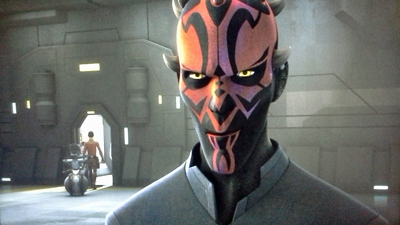 Dave Filoni, who did such a terrific job overseeing Clone Wars and the first two seasons of Rebels, left his supervising director duties behind in the third season in order to accept a promotion, so he named Justin Ridge to be his successor. 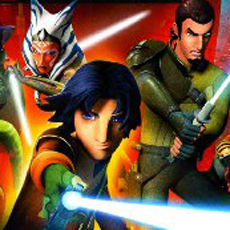 The show is in good hands, as Season Three quite credibly continues the saga of the Rebels over 22 episodes, portraying the rise of the Alliance while revisiting beloved Star Wars characters and creating a whole range of interesting new characters. As I’ve said before, the best compliment that can be given is that this show feels like the Star Wars that I grew up with. And, even more than previous seasons, this one sets up the eventual link to Episode IV: A New Hope. Still, there are plenty of call-backs to the prequels and the Clone Wars TV show, so this season feels very much like a bridge between eras. The second season had left the crew of the Ghost rather scarred, both physically and emotionally. 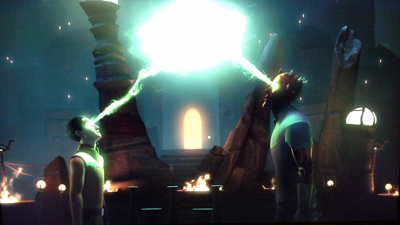 The Jedi Kanan was blinded, with his padawan Ezra blaming himself. 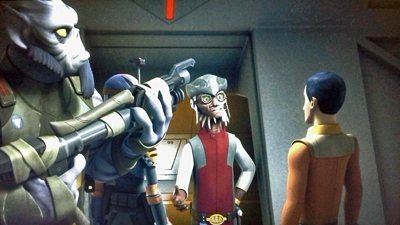 Ezra was toying with the Sith holocron, and finally opened it, against all common sense and the warnings of Kanan. Meanwhile, Ahsoka Tano’s fate was unclear. Six months later, as season three opens, the Ghost crew is still adjusting to the new status quo, and life at their new rebel base. 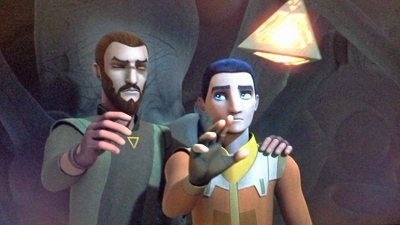 The first episode, Steps Into Shadow addresses the issues of the holocron and Kanan’s blindness, while introducing an ancient neutral Force-wielder named Bendu (voiced by Tom Baker), and also showing a mission to rescue the pirate Hondo (a favorite from the Clone Wars show) and ultimately steal a number of ships. It is a packed episode, full of action, drama, and humor, ably re-setting the show for what will be an exciting third season. 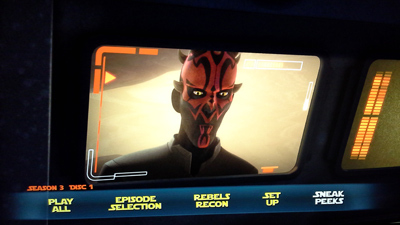 Both the Jedi and Sith holocrons figure into The Holocrons Of Fate, which also features the re-appearance of Darth Maul. After a hostage incident and an uneasy alliance is formed, there are visions shared, leading to Darth Maul voicing that he intends to find a certain man who is living on a desert world with twin suns. 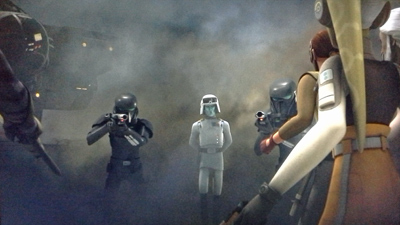 Another character from the films appears in the next episode, The Antilles Extraction, when Sabine infiltrates an Empire training base in order to find pilots who wish to join the Rebels. A big part of Season Three is the introduction to the show of Grand Admiral Thrawn, a popular villain from the Timothy Zahn novels of the 1990s. 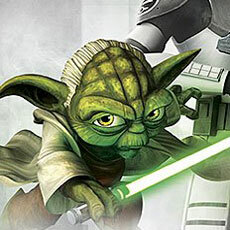 Originally depicted as a leading light in the Empire who gained prominence after the Battle of Endor (in the old chronology, before The Force Awakens rebooted everything), we now see Thrawn in his earlier days, a capable and calculating agent of the Empire, who makes it his mission to track down the Rebels and destroy the threat they represent. Thrawn comes face-to-face with the Ghost’s captain Hela, when she returns to her now-occupied home world in Hera’s Heroes. As with all the best stories, there’s the plot, about Hera retrieving a family heirloom, and then there’s the theme: “home” and “family” are not made up of things, but of those one is closest to. 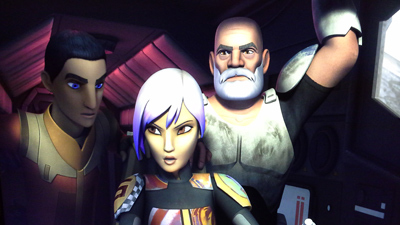 From there, the viewing audience is treated to reappearances of the Separatist battle droids, several episodes involving Sabine and her home planet of Mandalore, more of the entertaining rascal Hondo, a return to Ezra’s planet of Lothal (where a big revelation awaits regarding one of their biggest foes), a journey to Maul’s home world where we also revisit the Night Sisters, and a two-parter where the Ghost crew investigate the mystery of Geonosis. Ghosts Of Geonosis also introduces Saw Gerrera to the show, giving us an earlier look at the key figure from Rogue One. Though his physical appearance does not quite match up with the film version (even given that this takes place a few years earlier), Saw is voiced by his actor, Forrest Whitaker. Saw is portrayed as somewhat unhinged, though understandably so, given what the Empire did to his family. 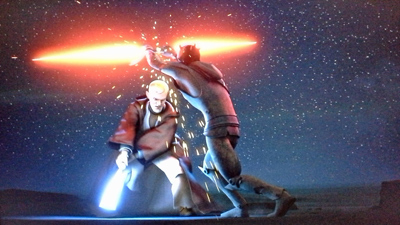 His rage is juxtaposed against the right of the Geonosians to avoid extinction. 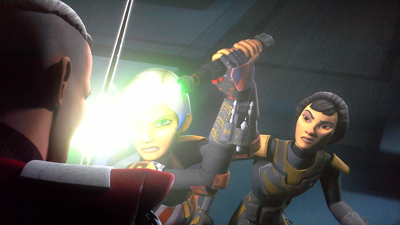 There is also family intrigue, with Sabine returning to her parents while wielding the fabled darksaber. 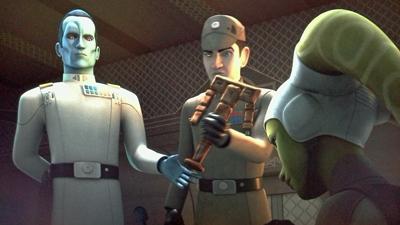 There is spy intrigue with Thrawn identifying the Fulcrum agent in his midst. And, quite importantly, there is the Secret Cargo that turns out to be the figure who will actually form the Rebel Alliance out of the various Rebel cells. And, as the season nears its conclusion, the big tease of Twin Suns finally pays off with the return of Obi-Wan Kenobi. These events certainly work towards bringing the show up to speed with A New Hope, but the season is not quite done yet. The two-parter Zero Hour closes off the season, as Grand Admiral Thrawn makes his move against the Rebels, and his long-planned trap is sprung. 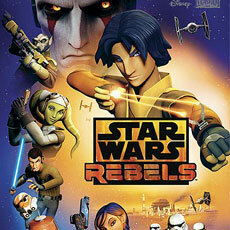 Tremendous adversity leads to partnership for the Rebels, with the story ending at a familiar Rebel base. The pieces are almost all in place now for Episode IV, with the rest to follow in the fifteen episodes of season four. This first disc goes straight to the main menu, after which the viewer has a couple of options. If you really missed seeing a trailer, you may select “Sneak Peeks” to get to the teaser for Star Wars: The Last Jedi (2:10). 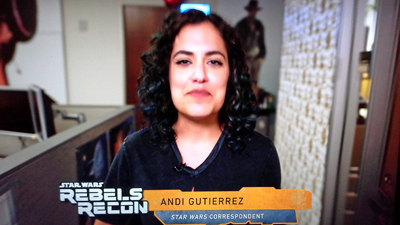 Other than that, there is the return of the Rebels Recon segments, a behind-the-scenes report on every episode of the show, featuring a variety of talent. I love these seven-minute featurettes, as they always seem to answer all the questions I had about production, and include factoids I never anticipated. Disc Two adds Audio Commentaries on Trials Of The Darksaber (with Executive producer Dave Filoni) and Legacy Of Mandalore (Filoni and a few others), in addition to the Rebels Recon segments. 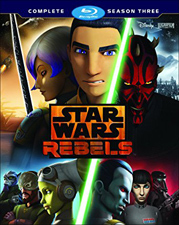 Disc Three is the most packed disc, with more Rebels Recon, three more Audio Commentaries by Filoni and friends, plus a few other featurettes that each delve deeper into important aspects of this season: A Rebel Alliance (6:10), Return to Mandalore (6:59), Thrawn: A Legend Reborn (6:59), Apprentices To Outcasts: Kenobi And Maul (8:47), and The Original Rebel: Saw Gerrera Returns – Extended (3:19). 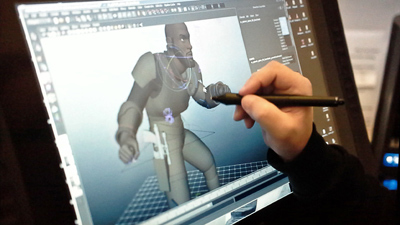 These featurettes each have members of the cast and crew, and multiple looks at the production of the show. It’s all good stuff. The three discs come in a case with no tray, so two discs must fit onto one oversized hub. My copy had no inserts, though normally there would be one for Disney Movie Rewards. The cover slip is embossed. I have to say, the covers for these Rebels releases have been stunning. The show, as ever, looks pristine on Blu-ray. The 16:9 image is basically without fault. There is even a little grain to be seen, helping the show avoid looing overly polished, even if the characters still look somewhat like marionettes. 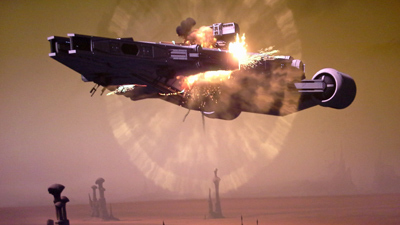 Any scenes with space battles or ligthsabers typically look especially awesome. Anyone hoping for these releases to finally go for lossless sound will be disappointed… again. Dolby Digital 5.1 is what is available (at least it’s not 2.0, I guess), which can be had in English, French, or German. (Well, actually, Spanish speakers do only get 2.0— sorry about that, amigos.) Still, it’s not all that long ago that Dolby Digital 5.1 is the best we ever had on home video, and it still sounds quite good. The sound mix is not as dynamic or engrossing as in the film series, but for a TV show it’s pretty fun. All of the classic Star Wars “bweeps” and “thweets” are here, so that’s a far cry from the days of Droids and Ewoks, at any rate. Subtitles are available in English, English for the Hearing impaired, French, and Spanish. 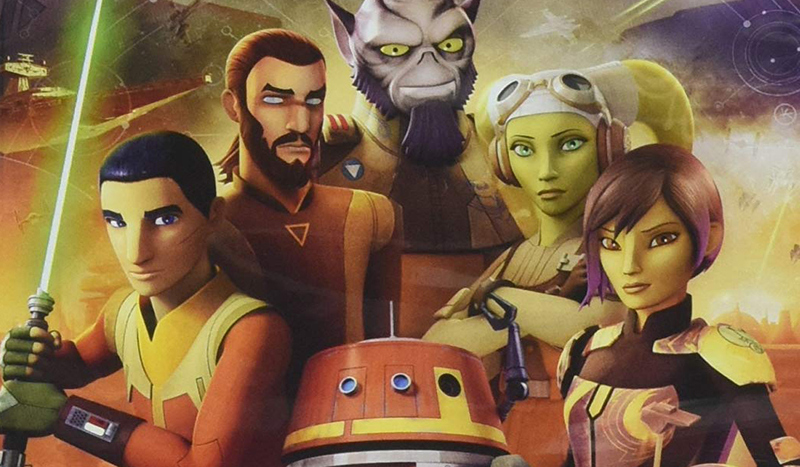 Star Wars – Rebels continues to impress. 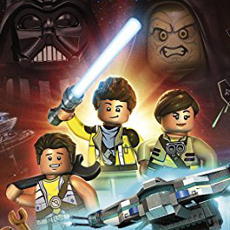 These characters have become an established and welcome addition to the canon, with the stories nicely bridging the gap between the original and prequel trilogies (note the symbolism of Ezra Bridger’s name). The Lucasfilm TV shows have satisfied in ways that the prequel trilogy did not, by incorporating what fans love about Star Wars, while not focusing heavily on what fans find boring. The stories contain a great mix of plot and characterization, and lots of action. Even for a kids’ show, there is enough drama to maintain adult interest, as well as great visuals. Fans will also enjoy the bountiful bonus features on this release. One more season to go!